Flying with film doesn’t need to be complicated. Plan ahead, be nice and follow a few, simple tips and you’ll wonder why you ever thought it was so intimidating. There are many film shooters who might be reluctant to fly with your favorite film camera packed for the simple reason that flying with film is too complicated or difficult. I’d like to propose that it’s not as much as you think, and the benefits are worth the perceived cost. Having just returned from a trip to Chicago, recording some information and fresh insights seems like a good idea. The questions have been asked millions of times: can film go through the x-ray and survive? Do you put your film in a checked bag, or carry it on the plane. Here is what I’ve learned in my own research from different sources including Kodak and Fuji, and from my own personal experience. Removing your film from original packaging in the hopes of cramming more into whatever case you’ll carry is a bad idea. First and foremost do not pack your film in checked baggage. The X-ray used to scan checked baggage is stronger (in some cases considerably stronger) than the x-ray used to scan humans and carry on baggage. If you think you can put your film in a lead-lined pouch and be free of worry – you’re wrong. They’ll simply crank up the X-ray to penetrate whatever you put your film in, further damaging whatever is in the bag they’ll eventually see into. I put my film in a small, black, zippered, padded case made by Eagle Creek Travel Gear. It fits 24 boxes of film perfectly. I always leave my film in its original packaging. Years ago on a flight to Haiti I made the mistake of removing all the film from its boxes to be able to fit more film in the case. When TSA opened it they had to swab every single canister of film for gunpowder residue, which is protocol. This took forever and I could tell they were a little exasperated by the whole thing. Nice n’ neat. When the TSA agent opens the zippered case to see the contents they’re met with original packaging, clean organization and a speed of ‘high speed’ film right there in front. Now I leave all film in its original packaging. 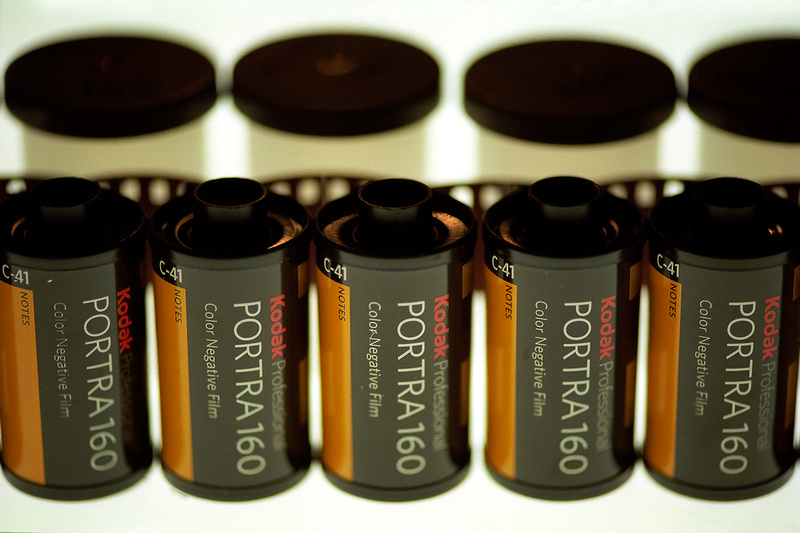 While it’s true I can fit less film in the case – I still have more than enough for my needs. When TSA opens the case and sees the nicely organized, neat, clean original packaging they’re far more willing to visually inspect, swab a few boxes, and call it good. My experience has been that TSA agents actually seem happy to break away from the grinding line of scolding people for putting to many items in a bin or being frisked – to step over to their table and investigate this neat, clean package for a brief moment. It seems to give them a break. It goes without saying that smiling, being polite, courteous, respectful and patient is good human behavior where ever you go – especially when someone has the power to either make your day miserable – or easy. Choose easy. Be nice. 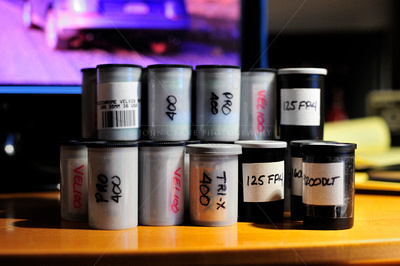 Occasionally I’ll have a TSA agent tell me film doesn’t need to be hand inspected if it’s not ‘high speed’ film. Rather than getting into a discussion about what constitutes ‘high speed’ film and arguing the counter points there in line (see below) – I simply add a few rolls of super high-speed film to end the debate. If they care to open the case and check, they’ll see ISO3200 film front and center. What may not be common knowledge is that x-ray scanning is cumulative. So if you allow your 400 speed film to pass through x-ray on the first leg of the journey it will probably be fine. But if it then passes through again, and again, and again – the effects of x-ray build up and at some point it fogs. I don’t know exactly what the point is. The Whole “film thing”… If you’re reading this blog, I’m sure I don’t need to explain the whole “film thing” to you. Empty the camera before sending it through x-ray. They will not hand-inspect the camera so whatever you have in it is going to get x-rayed. There’s no way around this. Best to simply fire off your final frames, remove the roll and tuck in your case for hand-inspection. If you follow these simple guidelines there’s no reason why you can’t fly with film. It does represent an additional step, compared to simply using a digital camera – but if ease were the main goal we probably wouldn’t be shooting film to begin with. So why go through all this? Why not just bring a digital camera and be done with it? This year my son went to Latvia for the summer. I remember having the conversation with him prior to leaving about his choice of camera. I offered one of my film Nikons, reasoning it was a once in a lifetime opportunity and he might be glad of something besides his iPhone. It turned into a rather comical skit of millennial vs. whatever I am (Boomer, I suppose). I let it go. A few weeks after he arrived in Latvia we were Face-timing and he admitted he’d made a huge mistake. Upon returning home he bought his first camera – a digital camera – but hey – baby steps, right? At least it was a Nikon. My point is, the trips in our lives come and go. The afterglow of a trip can last for many years if not a lifetime. The question I ask myself when getting ready to travel is, what gear is going to provide the results I’m most satisfied with a month or year after returning. The answer is always film. Hope that helps. E-mail me with any questions or comments about your experience flying with film.